These photos of Sydney City were taken from the AMP Centrepoint Tower, Sydney Australia in October 2004. 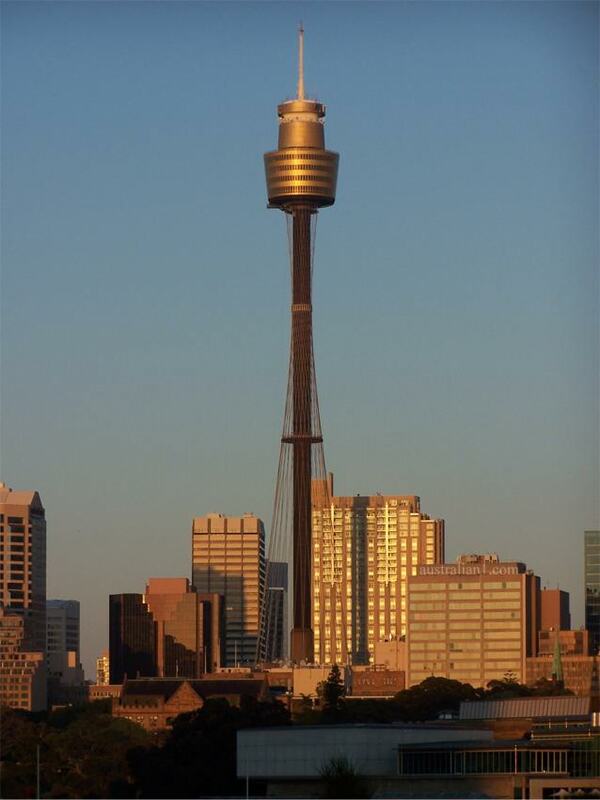 The photo below is of the AMP Centrepoint Tower which is where I took most of the photographs in the table above. The photo was taken at dawn from Potts Point / Woolloomooloo. There is a small park above the navel base. Sydney Tower (also known as the AMP Tower, AMP Centrepoint Tower, Centrepoint Tower or just Centrepoint) is Sydney and Australia's tallest free-standing structure, as well as the second tallest observation tower in the Southern Hemisphere (after Auckland's Sky Tower). The tower stands 305 metres above the central business district. The observation deck, which is open to the public, is 250 metres above the ground. It is located at 100 Market Street, between Pitt and Castlereagh Streets, accessible from the Pitt Street Mall, and sits upon Centrepoint (to which the tower is often referred), an office building and shopping centre. Construction of the office building was commmenced in 1970, and tower construction began in 1974. Public access to the tower began in August 1981. Every year, the Sydney Tower Run-up comprises the challenge of running up the stairs inside the tower as quickly as possible. I used a Kodak DX6490 4.0 mega pixel digital camera to photograph these images.